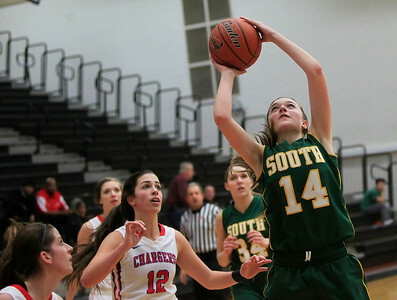 Candace H. Johnson Crystal Lake South’s Gaby De Jesus keeps an eye on Dundee-Crown defender, Francesca Scarpelli, in the third quarter during the Northern Illinois Girls Holiday Classic at McHenry West High School. Crystal Lake South won 56-48. Candace H. Johnson Crystal Lake South’s Chanel Fanter leaps up for a shot against Dundee-Crown’s Lauren Lococo in the third quarter during the Northern Illinois Girls Holiday Classic at McHenry West High School. Crystal Lake South won 56-48. 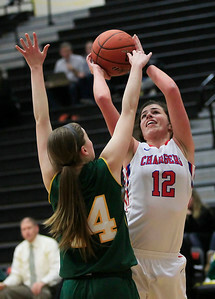 Candace H. Johnson Crystal Lake South’s Chanel Fanter blocks a shot by Dundee-Crown’s Lauren Lococo in the second quarter during the Northern Illinois Girls Holiday Classic at McHenry West High School. Crystal Lake South won 56-48. 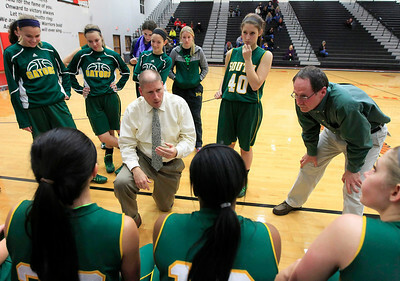 Candace H. Johnson Crystal Lake South’s Kyle McCaughn, head coach, and Joe Komaromy, assistant, talk to their varsity girls basketball players during a time-out in the fourth quarter against Dundee-Crown at the Northern Illinois Girls Holiday Classic tournament at McHenry West High School. 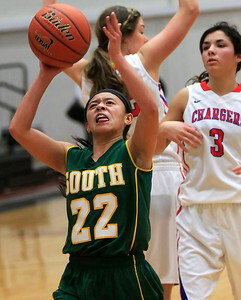 Candace H. Johnson Crystal Lake South’s Gaby De Jesus looks up for a shot after getting past Dundee-Crown’s Francesca Scarpelli in the fourth quarter during the Northern Illinois Girls Holiday Classic at McHenry West High School. Crystal Lake South won 56-48. 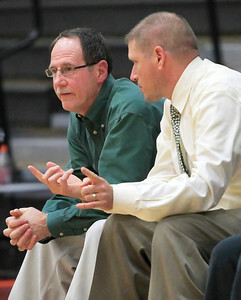 Candace H. Johnson Crystal Lake South’s Joe Komaromy, assistant coach, sits next to Kyle McCaughn, head coach, as he talks to the girls varsity basketball players in the fourth quarter during their game against Dundee-Crown at the Northern Illinois Girls Holiday Classic tournament at McHenry West High School. 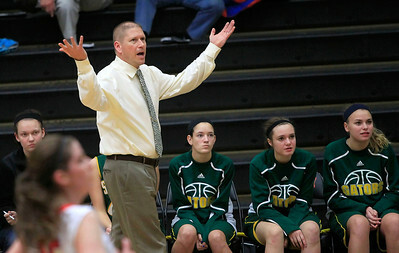 Candace H. Johnson Crystal Lake South’s Kyle McCaughn, head coach, reacts from the sidelines during the girls varsity basketball game against Dundee-Crown at the Northern Illinois Girls Holiday Classic tournament at McHenry West High School. 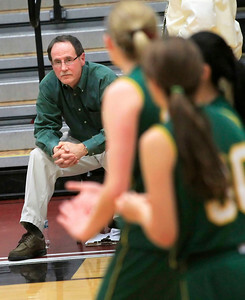 Candace H. Johnson Crystal Lake South’s Joe Komaromy, assistant coach, keeps an eye on his girls varsity basketball team as they play against Dundee-Crown in the fourth quarter during the Northern Illinois Girls Holiday Classic tournament at McHenry West High School. 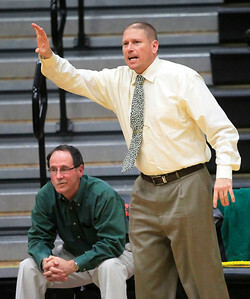 Candace H. Johnson Crystal Lake South’s Joe Komaromy, assistant coach, talks with Kyle McCaughn, head coach, as they watch their girls varsity basketball team play against Dundee-Crown during the Northern Illinois Girls Holiday Classic tournament at McHenry West High School. 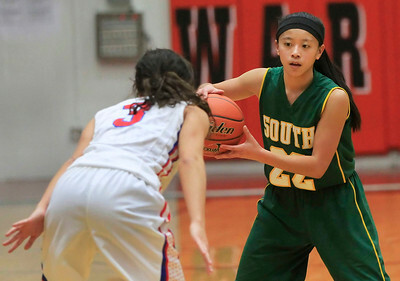 Crystal Lake South’s Gaby De Jesus keeps an eye on Dundee-Crown defender, Francesca Scarpelli, in the third quarter during the Northern Illinois Girls Holiday Classic at McHenry West High School. Crystal Lake South won 56-48.